In Age of Wushu Dynasty, anyone can be a master, with the vast, action-packed martial arts world of Jianghu always at your fingertips. 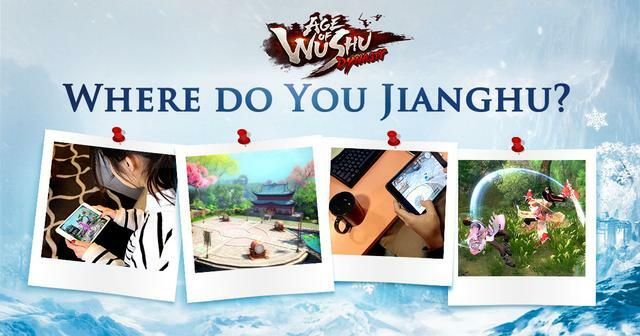 As people continue their journey to kung fu greatness, we're excited to announce the launch of our latest community event - Where Do YOU Jianghu? The event is simple - snap a shot of your favorite place to play Age of Wushu Dynasty. Whether you're camping out on the couch, knocking out a few levels on your morning commute, or sneaking in a Jianghu Adventure at work or school, take a picture and share it with the community for a chance to win in-game rewards! Valid entries should include a picture showing your device running Age of Wushu Dynasty. Submissions should also include your IGN and server, either in the text of your post, or written clearly on a piece of paper included in the picture. Lastly, please include an explanation of where your favorite place to play Age of Wushu Dynasty is and why. The submission window will remain open until midnight central time (UTC-6) on Sunday, February 28th. Our team will gather the valid submissions with their accounts, and will post them all to an album on Facebook to share with the community. Rewards will be issued within 3-5 business days. All valid submissions will receive a participation reward. From those who participate, we will choose 10 of our favorite submissions to receive a special grand prize. Validity of submissions will be determined by the Age of Wushu Dynasty community team.